If progressives are serious about economic and healthcare reform, they must embrace the same approach with Obama they once took with FDR and "make him do it." Barb Zangre cheers Healthcare for America Now rally at Capitol Hill, June, 25, 2009. Why is there so little protest in response to these hard economic times? One of the rare examples of civil disobedience occurred in late July, when more than 100 people, mobilized by the community organizing group ACORN, gathered outside a foreclosed home in Oakland and attempted to take it back on behalf of its owner. The owner, Tosha Alberty, said she is the victim of a predatory loan. She claims she had tried to work with her lender to modify the loan, but the lender refused. Alberty was at work on July 20 when sheriff’s deputies showed up and evicted her family from the house, she said. A few days later, the ACORN group sat on the steps behind the padlocked gate and refused to move. Six of them were arrested for trespassing. The protest was part of ACORN’s nationwide Home Defenders campaign to challenge foreclosures and evictions by lenders and to push Congress to strengthen anti-foreclosure legislation so that banks will be required to renegotiate mortgages. (The Obama administration’s program is voluntary.) The Oakland protest, however, received no attention in any major media outlet. A protest without reporters and TV cameras is like the proverbial tree falling in the forest that nobody hears. When the media cover rallies and protests, it gives people a sense that they are not alone, that others share their fears and hopes. It makes them more likely to get involved in efforts to bring about change. In recent years, right-wingers have been more willing to protest, whether their allies were in or out of power. With Obama in the White House and the Democrats in control of Congress, they’re exercising their memory muscle for creative dissent–and getting more media coverage than their liberal counterparts. 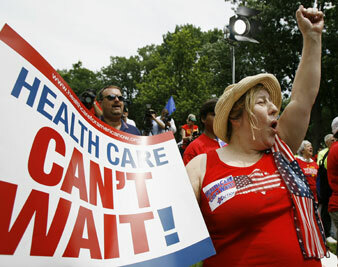 In recent weeks, for example, what the New York Times calls a “loose-knit coalition of conservative voters and advocacy groups,” including Republican activists egged on by right-wing radio talk-show hosts, have mounted protests in Texas, Pennsylvania and elsewhere to oppose Obama’s healthcare reform. On August 1, a few hundred conservative activists in Austin, Texas, some carrying signs that said “No Socialized Health Care,” surrounded Democratic Congressman Lloyd Doggett at a supermarket, where he was meeting with voters. The right-wing groups use Twitter and Facebook to recruit protesters and quickly put videos of their actions on YouTube. However narrow the constituency for these protests, the campaign is making headlines and contributing to the reluctance of centrist Democrats to back Obama’s healthcare plan. Public opinion polls reveal that Americans are angry about the current economic, healthcare, housing and environmental crises. Polls also document that a significant majority of Americans want the federal government to do something to fix these problems. But history shows that public opinion, on its own, isn’t enough to change public policy. People have to believe not only that things should be different but also that they can be different. Anger has to be mixed with hope. And to be effective politically, that hope has to be mobilized through collective action–in elections, meetings with elected officials, petitions, e-mail campaigns, rallies, demonstrations and even, at times, civil disobedience. Protest–including civil disobedience, demonstrations and large-scale marches–is not the same as mindless militance. It is not riots and rock-throwing. To be effective, protest must be strategic and disciplined, and it must capture the public’s imagination and conscience. People must view the cause as just and empathize with the protesters. As Martin Luther King Jr. explained in his famous “Letter From Birmingham Jail,” civil disobedience makes sense only when all other means of reaching decision-makers have been exhausted and people’s frustrations have boiled over. Since Obama took office, there have been very few public expressions of discontent. We’ve heard very little about everyday Americans–workers facing layoffs and the loss of health insurance, jobless Americans exhausting their unemployment insurance, renters facing eviction, homeowners facing foreclosures, farmers losing their farms, high school students facing cuts in school programs and college students facing rising tuition–mobilizing to demand immediate action to end their hardship and suffering. During the Obama era so far, union, community, environmental and other liberal activists have carefully calibrated their efforts on behalf of legislation. They’ve engaged in lots of lobbying and meetings with members of Congress. E-mails to politicians have been fast and furious. Unions and other groups are purchasing TV and radio ads to push centrist Democrats to support healthcare reform. There are occasional rallies and public forums to show support for the president’s agenda. Through Organizing for America, the lobby group created to sustain the momentum generated by millions of campaign volunteers, Obama has encouraged liberal bloggers and supporters to rally support for White House initiatives. This week, in response to the right-wing mob attacks on Democratic legislators, Obama wrote to the 13 million people on his OFA e-mail list and asked them to commit to attend at least one event this month to show support for his healthcare plan. These polite activities are necessary, but they don’t create a sense of urgency or crisis. With some exceptions, they don’t generate TV stories and newspaper headlines. They don’t put pressure on Congressional fence-sitters to fear a groundswell of negative publicity or a threat to their re-election chances. They are not sufficient to balance the influence of corporate campaign contributions. As a result, many of Obama’s initiatives face a stalemate. We confront the worst economic calamity since the Great Depression, with tens of millions of Americans suffering privately and silently while Republicans and centrist Democrats thwart efforts to bring about much-needed reform. How can progressives help put an end to this legislative gridlock? What can we learn from the experience of the Depression and the New Deal? The popular image of President Franklin Roosevelt is that of a progressive hero whose New Deal agenda changed the way Americans think about the role of government. These include the minimum wage; Social Security; the rights of workers to unionize; bank regulation; unemployment insurance; the eight-hour day; subsidized affordable housing for working families; cash assistance for the poor; and public works programs that not only created millions of jobs but also built libraries, parks, roads, energy facilities and conservation programs. But in his recent book Nothing to Fear: FDR’s Inner Circle and the Hundred Days That Created Modern America, Adam Cohen points out that when FDR was elected in November 1932, and even after he took office in March 1933, his ideas about what to do were very unclear. He promised Americans a “New Deal,” but he had very few specifics. In fact, FDR was in many ways a cautious, even conservative, politician. The one clear idea he had in mind when he took office was to cut the federal budget, and the person he hired to do that job was his budget director, a conservative Congressman from Arizona named Lewis Douglas. He was also initially reluctant to use the power of government to regulate business practices, create jobs or to support union organizing or struggling farmers. He was clear from the beginning, however, that core values were at stake–articulated in his first Inaugural Address. That is what created the ground–and support–for his pragmatic experimentation. Cohen’s book describes an ongoing battle for FDR’s heart and mind that took place both inside and outside the White House. Inside the White House, FDR’s progressive cabinet members and advisers–including Labor Secretary Frances Perkins, Agriculture Secretary Henry Wallace and top advisers Harry Hopkins and Rexford Tugwell–duked it out with moderate and conservative advisers. Outside the White House, grassroots organizations (including labor unions, community groups, veterans’ organizations and groups of small family farmers like the radical National Farmers Union) were pitted against an array of business groups (including banks, manufacturers, the real estate industry and corporate farmers). This same dynamic played out in the big cities among veterans, tenants, the unemployed, workers and the elderly. In the spring and summer of 1932, protest erupted among veterans of World War I, many of whom were out of work and hungry. More than 20,000 of them from across the country joined a Bonus Army march on Washington. The veterans held government bonus certificates for their military service, which were due more than a dozen years in the future. They demanded that Congress pay their bonuses immediately. Most of them camped in makeshift huts on the Anacostia flats, across the Potomac River from the Capitol. President Hoover ordered the Army to evict the veterans, which led to a bloody scene with horses, tear gas and machine guns in which two veterans were killed. After FDR took office, the veterans returned to Washington. In contrast to Hoover, FDR invited the Bonus Marchers to camp at a nearby Army fort and provided them with meals, medical care and entertainment by the Navy band. First Lady Eleanor Roosevelt visited the veterans and listened to their complaints. FDR didn’t restore their bonuses, but he did issue an executive order setting aside 25,000 places for veterans in the Civilian Conservation Corps, the first of the New Deal public works programs. In Michigan–where workers had taken over a number of auto plants–the sympathetic Democratic governor, Frank Murphy, refused to allow the National Guard to eject the protesters even after they had defied an injunction to evacuate the factories. His mediating role helped end the strike on terms that provided a victory for the workers and their union. The protests that occurred after FDR was elected, and that accelerated after he took office, were not spontaneous bursts of action by angry people. They were organized by people who were willing to take risks, acting somewhat on faith and suspecting that if they acted courageously, others would follow. As Marshall Ganz points out in Why David Sometimes Wins, a brilliant new book that focuses on Cesar Chavez and the farmworkers movement, the instigators of social movements don’t wait for the time to be “ripe.” They find people and invent or reinvent tactics to help them make the most out of what is typically an awful situation. They make their own opportunities, hoping, almost as a matter of faith, that at some point the crack will open wider and they will be able to take advantage of it. Often they fail and are thus lost to history. But as Ganz says, sometimes they win. And small victories whet their appetite for further change. If they have the skills, persistence and imagination, initial gains can become steppingstones to bigger victories as more people get involved. At the core of an effective social movement, Ganz explains, is a diverse group of leaders with a variety of skills, a deep commitment to their cause and a willingness to take chances without being foolhardy. In many cases, the instigators and organizers of the Depression-era protests were radicals who believed that New Deal reforms were a steppingstone to more dramatic change. Many of these radicals had been involved in activist causes for years; others were newly radicalized by the apparent collapse of the economic system and were recruited through issue groups. A self-conscious cadre of radicals helped lead groups as varied as the National Farmers Union; the Unemployment Councils, which engaged in eviction blockings and other militant actions in big cities; the Southern Tenant Farmers Union; and caucuses in workplaces, which laid the groundwork for industrial unions. They were joined by progressives and liberals–clergy, journalists, artists, tenants, workers, farmers, Jews, African-Americans, immigrants and others–who may not have shared the leaders’ radical vision but who were willing to try something new and different to bring about change. FDR’s election stimulated protest because it offered the missing piece–hope to go with the anger. Americans pushed aside their fear and protested for change. The organizers, in turn, helped channel people’s hopes into specific actions that had some likelihood of winning concrete victories. In time, FDR recognized that his ability to push New Deal legislation through Congress depended on the pressure generated by these protesters. As the protests escalated, Roosevelt became more vocal, using his bully pulpit to lash out at Big Business for its greed and selfishness. He used his speeches and his fireside chats to explain his New Deal agenda and to encourage people to contact their representatives in Congress. FDR was initially ambivalent about protest and about radicals. For example, he wasn’t happy about the pressure exerted by Upton Sinclair–the muckraking journalist, novelist and onetime Socialist–to endorse him after Sinclair shocked everyone by winning the Democratic Party nomination for governor of California in 1934 on a platform to “end poverty in California.” But FDR understood that Sinclair’s primary victory, and his impressive campaign and narrow loss in the runoff, helped change the nation’s political climate and made his own success more likely, since he could be seen as more moderate. Likewise, FDR wasn’t enthusiastic about the mounting protests by farmers, workers, veterans, community groups and the advocates of the Townsend Plan (for old-age insurance), but he understood their utility. He understood that the more effectively people created a sense of urgency and crisis, the easier it would be for him to push for progressive legislation. Having a president who inspires people to act collectively on their own behalf can make a difference. It gives people hope and courage to defy obstacles. Two recent union victories reflect this dynamic. Last December, more than 200 members of the United Electrical, Radio and Machine Workers (UE) illegally occupied their Chicago factory after their employer, Republic Windows and Doors, abruptly told them that it was shutting down the plant. The UE members peacefully took over the plant, where some had worked for decades, and demanded that Republic Windows and Doors and the bank that refused to extend credit to the company, find a solution. This was not a spontaneous protest. The UE leaders and organizers had been anticipating the need to engage in this kind of direct action. They had talked about it among themselves and prepared for it. The UE has a long history as a feisty progressive union. When the opportunity for direct action presented itself, the UE organizers and leaders were ready. Although the workers were breaking the law, no politician called for the Chicago Police Department to arrest them–a sure sign that the UE action had become a symbol of working families’ distress in the unraveling Bush economy. Two days later, at a news conference to announce Obama’s new secretary of veterans affairs, a reporter asked the president–who had not yet taken office–what he thought about the protest. With that statement, Obama used his bully pulpit to endorse the protest and to put pressure on Republic’s management and the Bank of America (the company’s lender, which was about to withhold further credit, thus precipitating the factory closure) to forge a solution. Representatives of the company, Bank of America and the union began meeting at the bank’s office in Chicago. Congressman Luis Gutierrez moderated the talks. Another company agreed to purchase the factory, keep it open with current employees and honor the union contract. Obama’s stimulus program helped create a growing demand for energy-saving building products, which guaranteed the company more consumers. Obama’s election had given the workers enough hope to try the impossible, and it worked. By quickly endorsing the workers’ protest, Obama showed the kind of bold leadership that progressives had been hoping for. That same month, after a brutal fifteen-year organizing battle, workers at the world’s largest hog-killing plant in Tar Heel, North Carolina, voted to unionize. The 5,000 workers at the Smithfield Packing slaughterhouse–60 percent of whom are African-American–had rejected union membership in 1994 and 1997 after being subjected to the company’s illegal harassment and intimidation in a state known for its antiunion climate. The workers’ vote in favor of the United Food and Commercial Workers was one of the largest private-sector union victories in many years and the biggest in the UFCW’s history. For students of the Depression era, the dynamic was familiar. Obama’s election gave the Smithfield workers hope. Their union staff and leaders took advantage of this new mood to re-energize the rank-and-file workers. After fifteen frustrating years of unsuccessful organizing, their work finally bore fruit. Since Obama’s election, however, we have not seen little of that kind of effective protest–the kind of bold action that would make the media take notice and perhaps help galvanize Americans to take action, even if of a less risky kind.